Complete line of hand-crafted solid wooden and nylon practice and sparring swords. Fully functional and historically accurate. Strong enough to meet and exceed all martial training practice needs. Specializing in 15th and 16th century European bladed weaponry and high quality training weapons throughout the world. If your ultimate goal is to wield a razor sharp sword safely and effectively, you need to train with a sword that approximates the size, feel and heft of a live blade, yet minimizes the possibility of causing grievous or permanent injury to yourself or your training partner. A Celtic Wood Sword or ''waster''allowed a warrior to practice full combat safely. Fully seasoned and hand crafted in solid hardwood. The Escrima Stick has a natural light brown color. Foam Practice Halberd or Spear. Our new line of foam practice swords and arms are hand-made by local craftsmen and developed as training tools for either SCA fighting styles, LARP or Stage practice. Foam Practice Axe or Mace. Our new line of foam practice swords and arms are hand-made by local craftsmen and developed as training tools for either SCA fighting styles, LARP or Stage practice. Latex Hero Sword has a rubber handle for good balance and excellent control. The lightweight fiber core of this quality latex weapon assures long lasting play. It is a great piece to use for practice or just for play. This Medieval One-Hand Synthetic Training Sword from Cold Steel is made from the heaviest grade polypropylene available and closely duplicates a real sword in length, size, weight and feel. This Hand and a Half Synthetic Training Sword from Cold Steel is made from the heaviest grade polypropylene available and closely duplicates a real sword in length, size, weight and feel. A wooden Two Hand Sword or "waster" allowed a warrior to practice full combat safely and economically while preserving his precious steel for the real battle to come. Fully seasoned and hand crafted in solid hardwood, with contrasting wood guard and pommel. A wooden Single Hand Sword or ''waster''allowed a warrior to practice full combat safely and economically while preserving his precious steel for the real battle to come. Fully seasoned and hand crafted in solid hardwood, with contrasting wood guard and pommel. This Single Hand Medieval Wooden Sword, or waster, allowed a warrior to practice swordsmanship safely. Made entirely from wood, the blade, guard and pommel are one solid piece of wood. This wooden Gladius is suitable for light sparring and the safe practice of techniques and forms. It can also make for a safe costume or stage sword. Take along one of our Roman Mainz Gladius Wooden Swords to your next event. Lightweight, looks like a sword! Take along one of our wooden Wooden Pompeii Gladius swords to your next event! Lightweight, look like swords and priced right. Our Ninja Boken is made from Solid hardwood, black finish, foam collar. 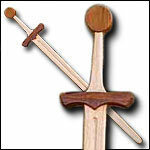 Our Mini Wooden Excalibur is perfect for a child's dagger or a toddler's sword. Single Hand Foam Practice Sword. Our new line of foam practice swords and weapons are hand-made by local craftsmen and developed as training tools for either SCA fighting styles, LARP or Stage practice. Two Hand Foam Practice Sword. Our new line of foam practice swords and weapons are hand-made by local craftsmen and developed as training tools for either SCA fighting styles, LARP or Stage practice. Here is our Xtreme Synthetic Sparring Longsword-White Blade designed in conjunction with Dave Rawlings. Here is our Xtreme Synthetic Sparring Longsword-Black Blade designed in conjunction with Dave Rawlings. Here is our Xtreme Synthetic Sparring Longsword-Silver Blade designed in conjunction with Dave Rawlings. Here is our Xtreme Synthetic Sparring Single Hand Sword-White Blade designed in conjunction with Dave Rawlings. Here is our Xtreme Synthetic Sparring Single Hand Sword-Black Blade designed in conjunction with Dave Rawlings. Here is our Xtreme Synthetic Sparring Single Hand Sword-Silver Blade designed in conjunction with Dave Rawlings. Wooden Gladius Roman Swords were not only the wooden swords used by Gladiators for training, but if he survived the arena and lived long enough to retire, a symbolic wooden gladius (rudis) was awarded as a token of discharge and freedom. This Medieval Synthetic Training Sword is made from polypropylene available and replicates a real sword. Not quite as stiff as wood, but it does have the advantage of being impervious to the elements. Black polypropylene construction. This Medieval Synthetic Training Short Sword is made from polypropylene and replicates a real sword. Not quite as stiff as wood, but it does have the advantage of being impervious to the elements. Black polypropylene construction. A Two Handed Wooden Sword or waster allowed a warrior to practice full combat safely. Made entirely from wood, the blade continues through the guard and includes a minimal wooden pommel. This Single Hand Wooden Sword, or waster, allowed a warrior to practice full combat safely. Made entirely from wood, the blade continues through the guard and includes a minimal wooden pommel.